Cuba responded to and recovered from a Peak oil situation and a period of economic collapse following the following the fall of the Soviet Union in 1991. The United States is currently consuming 5 barrels of oil for every barrel extracted. This is an American documentary film that explores the economic collapse and eventual recovery of Cuba following the fall of the Soviet Union in 1991. 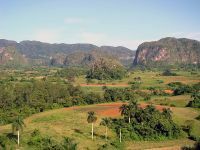 Following the dramatic steps taken by both the Cuban government and citizens, its major themes include urban agriculture, energy dependence, and sustainability. The film was directed by Faith Morgan, and was released in 2006 by The Community Solution. The film is a reflection of the peak oil scenario advocated by oil industry experts and political activists, including Matthew Simmons and James Howard Kunstler. The Cuban economy, heavily dependent on economic aid from the Soviet Union, suffered tremendously following the end of the Cold War. The nation lost half of its oil imports, and 85 percent of its international trade economy. Cuba began a slow recovery focused not on finding new energy sources, but on rejecting consumption in favour of sustainable growth. The film seeks to educate audiences about peak oil and the impact it will have on transportation, agriculture, medicine, and other industries. Video: Megan Quinn of The Community Solution discusses her visit to Cuba, and the movie "The Power of Community"